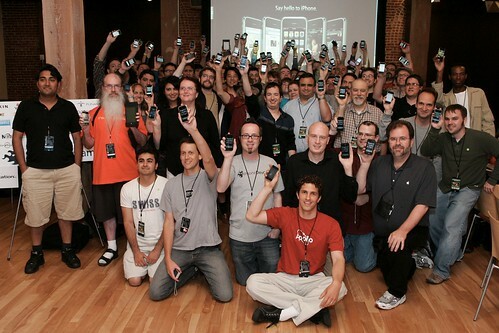 The iPhone 3G was launched on July 11 (only 20 days ago) and Apple sold a million units in the first 3 days. I got my 3G on launch day. And this time the lines were even longer (cheaper phone, more demand) while unlucky customers faced a network infrastructure jammed with simultaneous requests to set up AT&T contracts for each phone. Despite initial difficulties, iPhone fans persevered and got their shiny new objects. 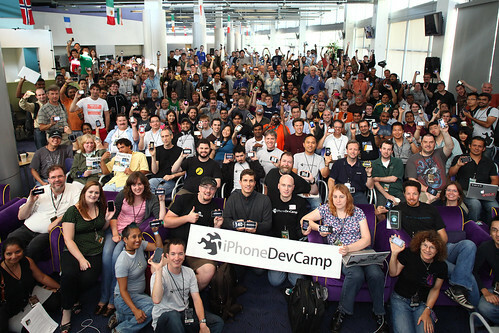 And those fans who hack are ready for this weekend’s iPhoneDevCamp 2 in San Francisco. This year’s organizers — Raven, Dom, Chris, Blake — have done a phenomenal job pulling in sponsors and handling logistics, volunteers, speakers and developers. Developers, testers and hackers will gather at Adobe’s offices tomorrow to start designing and building code for the iPhone and iTouch through the weekend. They’ll use the iPhone’s SDK as well as web technologies to build cool iPhone friendly apps. A hackathon contest will be held on Saturday and Sunday (August 2-3) to promote open source community values of sharing, contributing and openness while churning out some serious code. At the end of the contest on Sunday, each app will be demonstrated and qualified participants will win cool prizes. I can tell you from experience, the prizes are really neat (developers even won iPhones last year). To top it off, the excitement doesn’t stop in San Francisco. With satellite events happening concurrently in Austin, Chicago, Colorado, Portland and Seattle and internationally in London, Paris and India (Yeh!) , this weekend will buzz with activity. Can’t wait to see the fun begin tomorrow evening! See you there. This entry was posted in Apple, Community, iPhone, Unconference and tagged Apple, Community, iPhone, Unconference on July 31, 2008 by Alolita Sharma.